One person has been killed and nine injured after an explosion at a chemical plant in China's eastern Shandong province, state media report. Xinhua news agency said a warehouse in Zibo city exploded, triggering a fire. Huge flames were visible. The site is just 1km from a residential area. No contamination had been detected, the agency said. Earlier this month, blasts involving chemicals killed at least 121 people in the city of Tianjin, further north. Hundreds were injured and 54 are still missing. The proximity of industrial and chemical plants to residential areas has become hugely controversial. Widespread public anger over the deadly explosions in Tianjin has led to promises to improve China's patchy commitment to industrial safety, says the BBC's Celia Hatton in Beijing. Last week, an inspection of places storing hazardous chemicals in Beijing unearthed safety issues at 85 out of 124 sites, resulting in two emergency factory closures. 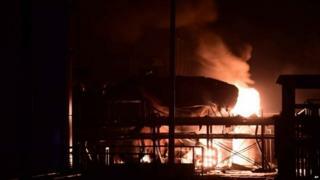 The explosion at the Runxing chemical factory occurred just before 21:00 local (12:00 GMT) on Saturday, triggering a fire. Windows shattered at the scene of the blast and vibrations could be felt 2km from the site. About 150 firefighters and 20 fire engines fought the blaze, Xinhua said. The state-run Beijing Times said the Runxing plant contained adiponitrile - a colourless liquid that releases poisonous gases when burned. Howard Zhang of BBC Chinese says that the blasts at Shandong and Tianjin have taken on a political significance and threaten to overshadow China's celebrations of the 70th anniversary of its victory over Japan in World War Two. The operators of the Tianjin site are being investigated for allowing dangerous chemicals to be stored too close to homes. How safe is Tianjin after blasts? The blasts there raised fears of contamination by toxic substances. Officially the minimum distance between businesses with dangerous chemicals and public buildings and transport networks is meant to be 1km. But data from the Tianjin incident showed there were at least three major residential communities inside that distance from the warehouse.